Stumped on how to incorporate bright, fun colors in your groomsmen's attire? Well Courtney's knew just where to hide the surprise! 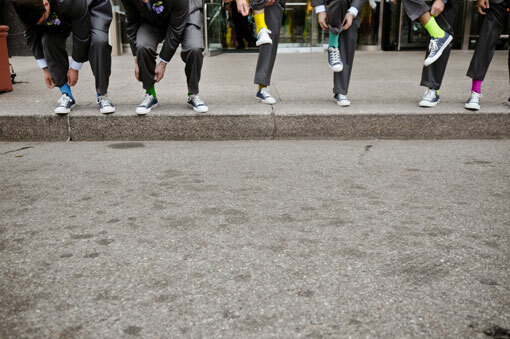 They all wore white and navy blue ties with varying designs along with a white dress shirt, but coming between their feet and their blue Chuck Taylors were We Love Colors nylon socks in colors like Yellow, Scout Green, and Fuchsia! Check out the great wedding picture below of the guys showing off their stylish ankles.